The country’s latest Group 1 race is Saturday’s Surround Stakes 2018, betting tips and updated odds on the Chipping Norton Stakes Day support act in Sydney detailed below. Alizee is the 2018 Surround Stakes favourite and Races.com.au tip to win the Randwick Group 1 on Saturday in Sydney. Photo: Steve Hart. 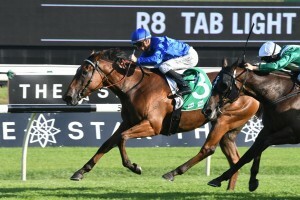 Set to run as Randwick Race 7 at 4:10pm (AEDT) one race after Winx chases her 23rd win on the trot in the 2018 Chipping Norton Stakes, this season’s Group 1 $500,000 Surround Stakes (1400m) features 11 three-year-old fillies. Of the current contenders in the first Group 1 running of the Surround Stakes, the best in betting at Ladbrokes.com.au paying $2.20 is James Cummings’ last start Group 2 Light Fingers Stakes (1200m) winner at the track Alizee. The well-bred daughter of Sepoy is already an elite level winner having taken out the Group 1 Flight Stakes (1600m) over the Randwick mile in the spring and should relish the step-up in distance on Saturday after her narrow first-up win over the 1200m. She has ace Randwick form (7:3-1-0) and only needs to overcome her wide barrier 10 draw to beat this field of familiar rivals. The biggest dangers to Alizee continuing her winning ways this autumn according to the Surround Stakes betting markets are the rails-drawn Shumookh ($4.40) who looks likely to set the pace out to gon one better than her second in the Light Fingers Stakes and last year’s Golden Slipper runner-up Frolic ($10) who looks well-suited to a rain-affected track. So will the best in betting get the job done or is there an upset Surround Stakes result pending from the likes of the Myer Classic winning Shoals ($11) or even Lindsay Park’s upset Vanity Stakes winner in Melbourne last start Rimraam ($18)? Even from the draw Alizee is the hard-to-beat favourite and she’s easing in the markets opening up a tiny bit of value for the Light Fingers Stakes winner. She will only be fitter for the run second-up and enjoy the rise to 1400m having won over a mile at this track in Group 1 company. A class filly who was off the pace winning last time out and should repeat that pattern here at her pet track again (7:3-1-0). Good odds offered on the Kiwi Melody Belle who is out to atone for her fifth in the Light Fingers Stakes. She’s better over this distance, undefeated at 1400m (2:2-0-0) and the Soft-rated track works to her advantage (4:2-0-1). Booking of Winx jockey Hugh Bowman a huge plus so that combined with the wet track form make her a danger at a price. Also at double-figures with genuine claims is this in-form Commands filly for Lindsay Park. She hasn’t raced in Sydney before, but if she handles this way of going can challenge. First-up winner of the Group 3 The Vanity (1400m) adding to her good record at the distance (3:1-2-0) and she beat some nice types in that Flemington race including Australian Guineas fillies this weekend Bring Me Roses (2nd) and Aloisia (5th). Whether you’re backing or sacking the fillies in our Surround Stakes 2018 tips make sure you access the best Randwick racing odds through Ladbrokes.com.au.